Bhagidari Cell of Delhi Govt. 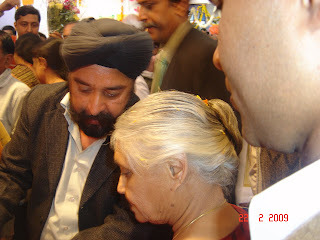 Mrs. Sheila Dikshit, Ex Chief Minister of Delhi took personal initiatives for the success of the Bhagidari scheme. Her presence in work shops as well various Bhagidari utsavs gave a boost to this Scheme. The hearing of problems being faced by various RWA's through Video conferencing & instructing various department heads, online was really commendable. We can say that, the Govt. of NCT of Delhi had accorded great importance to the Bhagidari Scheme. This scheme seeked to promote a meaningful partnership between the Govt. agencies and citizens, basically covering the provision of civic services. Though, the successful implementation of this approach required the ability to understand public needs, a high degree of innovation and willingness to adopt a problem - solving approach. The Delhi govt. had made Bhagidari the root of all developmental and welfare schemes. How to register your RWA under the Bhagidari Cell of Delhi Govt. After the Congress lost power in Delhi, for the time being, there seems no Bhagidari Cell anywhere in Delhi. It's definitely a great loss to the RWA community. We expect that after the Fresh Delhi Assembly Elections, whosoever comes to power, there must be a Bhagidari cell in Delhi. Therefore, presently, you can not register under the Bhagidari Cell. Earlier it was required that If you wished to Register your RWA with the Bhagidari cell of Delhi Govt., you had to write a letter on your letterhead to Bhagidari cell alongwith a copy of your Registration certificate, Mamorandum of Association & list of Office bearers. Bhagidari cell used to Exist at the Office of the Chief Minister, Delhi Secretariat, New Delhi - 110002. Thanks to Ex CM & Ex Bhagidari Cell of Delhi Govt for these workshops.